Maintaining printing presses to Fogra standards is becoming more of a priority. As time goes on print buyers expect their printed results to be run to these accepted printing standards (ISO 12647-2). 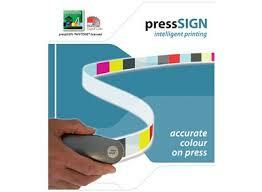 This is why pressSIGN software is now widely used by many prominent print companies. PressSIGN is an invaluable tool for a press minder. The software produces an in depth analysis of how each job is printed and what pass rate was achieved while the press is running. The software provides up-to-date information about dot gain, overprint, grey balance info etc, all in a format that is easy to understand and, therefore, enables the minder to make running adjustments to any job. Managing customer expectations and delivering on them is only possible with software like pressSIGN. It is easy to use and it links PrePress and the Press room, making it easier to match the proof to the final printed job on the press. We have our own Technical Manager who is DPE certified and can help you get your press running to ISO 12647-2, both coated and uncoated paper stocks. SOS can offer this as a ‘Check Up and Tune’ service, or you can buy the software outright and do it yourself. For professional guidance and advice, please contact us.